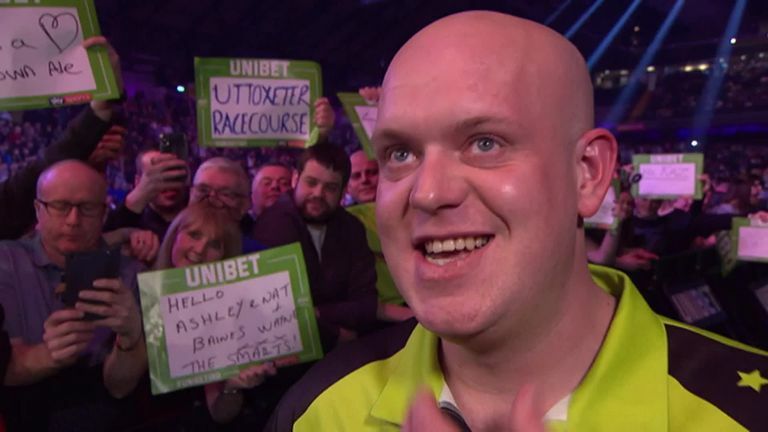 Michael van Gerwen and Michael Smith put down a marker to the rest of the Premier League with a titanic tungsten tussle in front of 8,000 fans at the Utilita Arena in Newcastle on Thursday. The road to Play-Offs night at The O2 began with fireworks in the north-east, with a quick reunion of last month's World Championship finalists at Alexandra Palace, and the duo did not disappoint in a rip-roaring contest won by the Dutch ace. 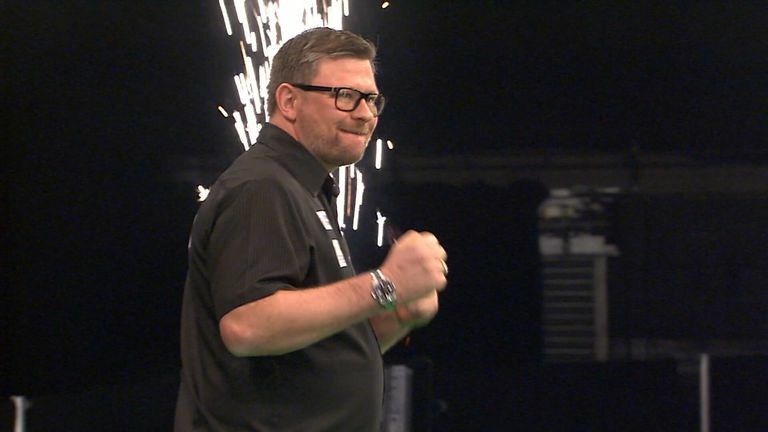 The opening clash of the 2019 Premier League saw James Wade produce a top-quality performance against Raymond van Barneveld in a clash of the former champions. 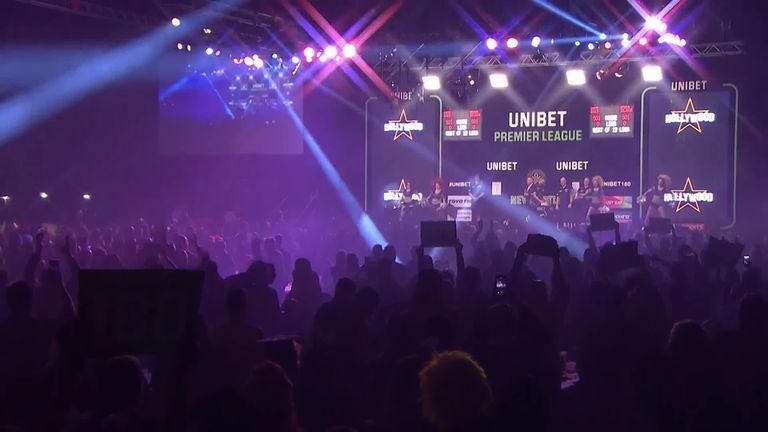 There was also a famous win for Welshman Gerwyn Price, while Chris Dobey produced a heroic performance with six maximums to hold Mensur Suljovic to a draw and it was the same conclusion in the match between Peter Wright and Rob Cross. 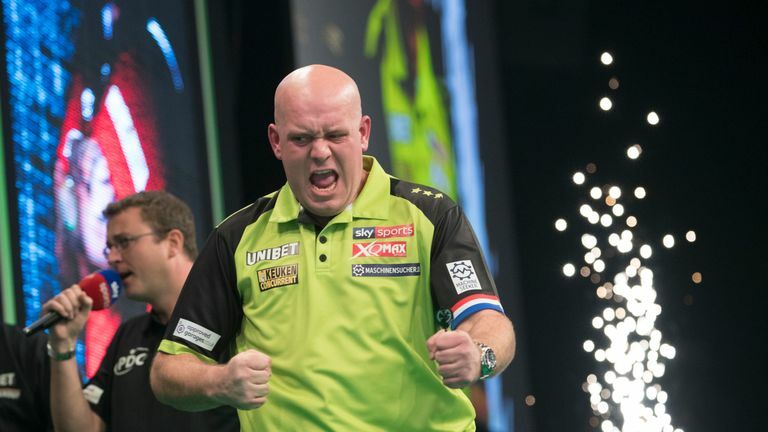 Recently crowned a three-time World Champion, Van Gerwen is seeking a fifth Premier League title, and his fourth consecutive crown. A table-topper every year since his debut season in 2013, the world No 1 has not tasted defeat in a televised match since November 2018, a trend he continued in clinical fashion against 'Bully Boy'. Smith was seeking to avenge his defeats to Van Gerwen in the 2018 Premier League final and the recent World Championship decider at Alexandra Palace, but having already won the World Championship and the Masters this year, Van Gerwen continued his relentless form with a fifth maximum and an 81 outshot in two darts to win a decisive 12th leg and take the spoils with a three-dart average of 104.98. Former World Champion Cross and world No 3 Wright slogged it out in the final match of the night as they settled for a point apiece. 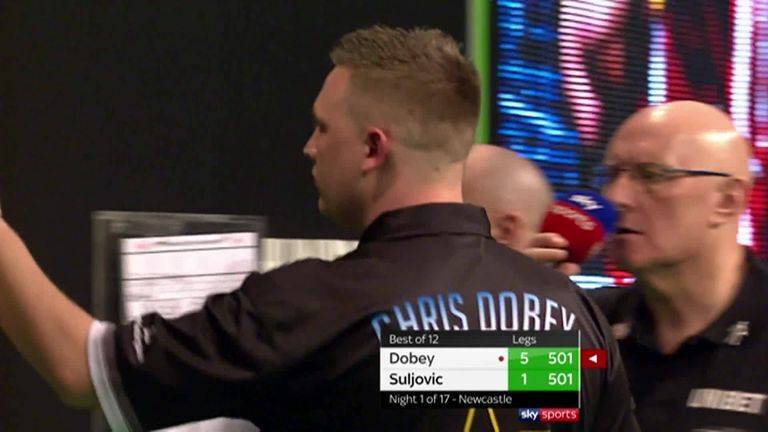 'Snakebite' averaged close to 116 after falling 3-1 down to claw his way back and land 88 on the bullseye to establish a 4-3 lead in what was turning into a see-saw struggle. 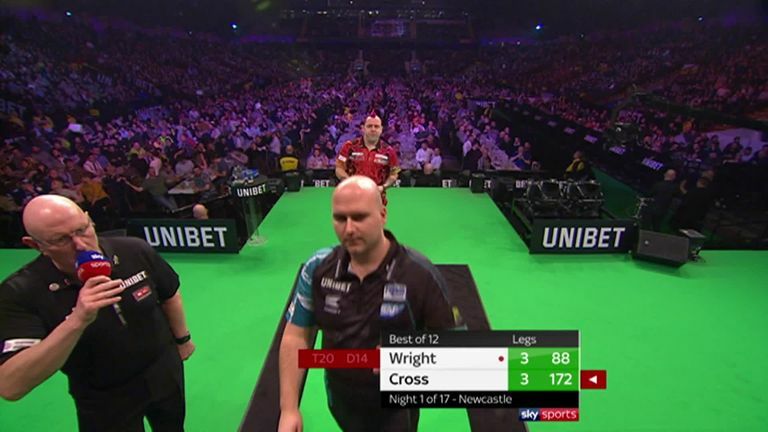 Wright won five out of seven legs but after missing D18 to win the match, Cross nipped in for D16 to earn a point as both men averaged over a ton. 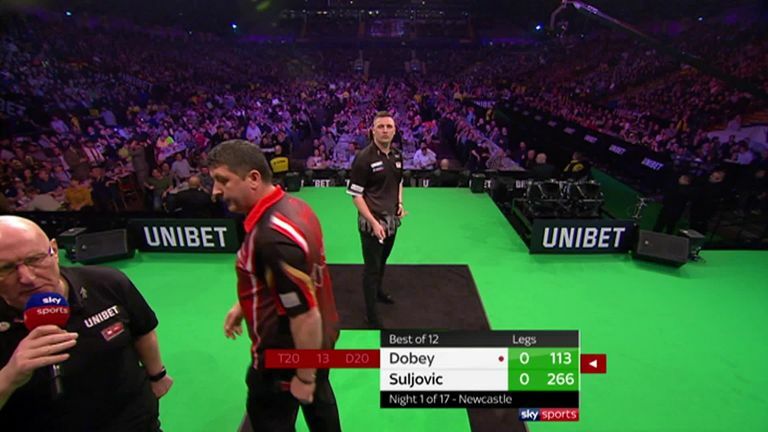 With no Gary Anderson in this year's Premier League, the injured Scot is being replaced by nine debutant 'Contenders' made up of rising stars and local favourites and top Toon talent Dobey was the first of them to take to the stage in front of a passionate Newcastle crowd as he faced two-time TV title winner Suljovic. 'Hollywood', the world No 35, made an inspired start by burying a maximum before notching a 113 finish in the first leg. He moved 4-1 up with a cool 64, averaging over 102 in an accomplished performance, before landing 84 on the bullseye to extend his advantage. But the big Austrian found his form by rattling off five consecutive legs to guarantee a point and a point was all he could muster in the end as Bedlington darts star Dobey held his nerve to secure a deserved draw. Barney clinched his only Premier League back in 2014 but that win was his last major title. The 51-year-old has slipped to 28th in the world rankings and was beaten in his first match at the World Championship by unseeded Lithuanian Darius Labanauskas. He was out to prove that he could still mix it with the best in the first game of the Dutchman's final campaign before retirement at the end of the year and after sinking a 104 checkout, he nailed tops for a break of throw in the seventh leg. 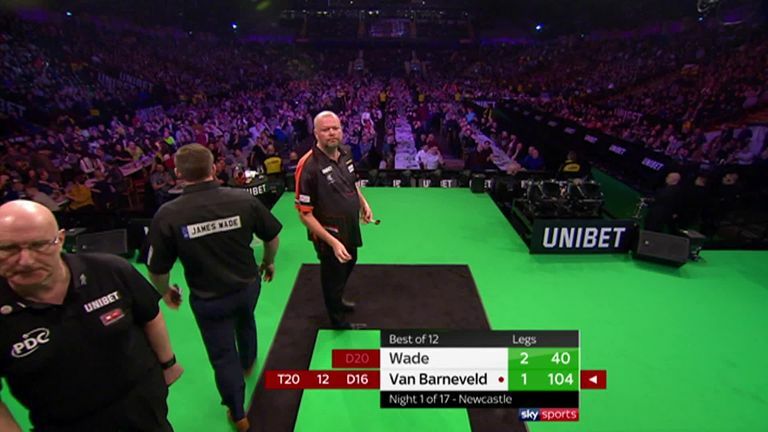 Three missed darts at D20 cost Van Barneveld a chance to stretch his lead and Wade punished his opponent by finishing off 50 thanks to a two-dart combination. 'The Machine' landed his favourite D10 to stretch his lead and he banked maximum points with a classy 124 on the bullseye, finishing with a three-dart average of 99.24. 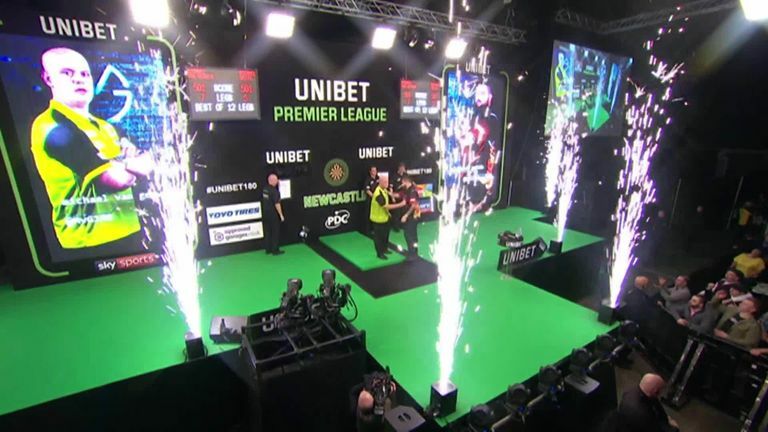 Grand Slam of Darts Champion Price sealed his first-ever Premier League win with an outstanding display against Players Championship Finals winner Gurney, averaging 104.11. The Northern Irishman won the opening two legs before Price, who finished bottom of the table last year, hit back to win five on the bounce with some slightly over-exuberant celebrations along the way. 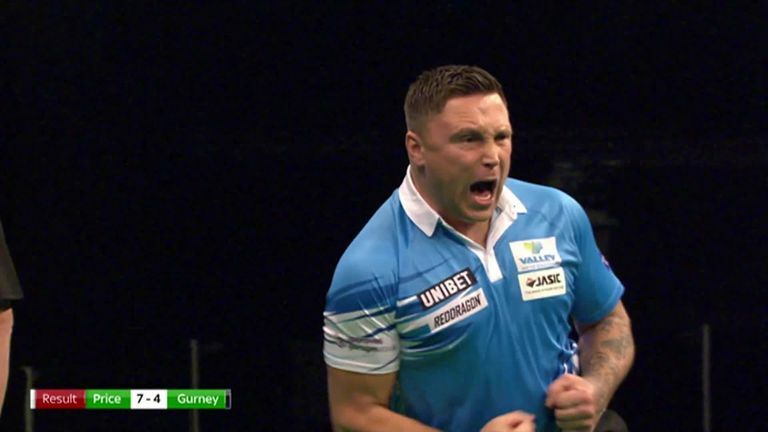 We know Gerwyn can play like that, he just hasn't been himself since the Grand Slam. It's not just his first win in the Premier League, it's his first win since winning the Grand Slam final. He's back winning now and that will help him. Gurney was comprehensively outplayed by Price and he has now only ever beaten his opponent once in 10 meetings.